City of Asturica Augusta, Astorga (Leon). where the most outstanding remainings were found. Roman legiones designed their castra was real cities, up to the point that many of the did become actual cities. During Cantabrian wars -28 b.C to 19 b.C- many castra were set on Leonesian lands: from one of them city of Asturica Augusta, actual Astorga was created. Later, these castra became more important, ca. 22 b.C., because of Astures revolutions and proximity to gold mines of Las Medulas. Therefore, Legiones VI Victrix and X Gemina inhabited this castra. Strategically placed between rivers Tuerto and Jerga few remainings survive from it. The most part was lost when the city was built at 35 on them. It only remains exterior shelter ditches -fossae fastigata- and a part of the wall. At year 35, first constructions were built with a help from the army. When this castra became a city, a new plan was redesigned, since mines plans give Asturica Augusta a relevant importance: there lived great persons of social, legal and economic life of Roman Hispania. Termae. There are two termal wholes at Astorga: Major and Minor termae. Minor termae. They were probably constructed for high society. Though they were conceived on line, they suffered later modifications. Caldarium was duplicated and its access order was changed: it was placed after sudatorium. We can see a part of the cellar, a furnace -the new one- and excavations for the elder one; many bathrooms, tide rooms and the duplicated caldarium. Major termae. They are public buildings. Therefore they were placed at the center of the city. Comitium. Remainings do not let many clear conclusions about its buildings dispositions. We know it was big and limited by a monumental portico -the Ergastula- with an exterior wall of Roman concrete. The central axis was placed on a high point: the temple of Aedes Augusti. Temple of Aedes Augusti. 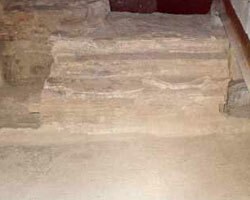 It was a building with great dimensions placed on a hill inside the Comitium. There are few remainings from it. We can imagine the plan of a temple with a portico in antis and a cella finished by an apse. Its big walls point to a posible vaulted cover. Pavement is made of marble with geometric figures, and the walls of concrete -opus caementitium-. It was a temple devoted to Imperial worship. Houses -domus. Houses we can find after excavations belong to a rich social group. Therefore our judgement cannot be applied to the inhabitants of the whole city. They used to have a hall with a fountain, and a central patio with a swimming-pool -impluvium-. Over it, there were rooms -cubicula-, dining-rooms -triclinia-, and service and access areas. The most outstanding were completed at its back part with another patio with columns -peristylum- decorated with fountains and gardens. The domus of Mosaic of a bear and birds must be pointed out. It was a rich family house with a single floor. It had its own baths, a feature that shows its owner richness. 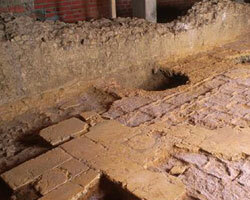 Excavations let us see just a part of the house, since it is under a convent. Changes from its general design can be seen: they would be made because of a family economic improvement. 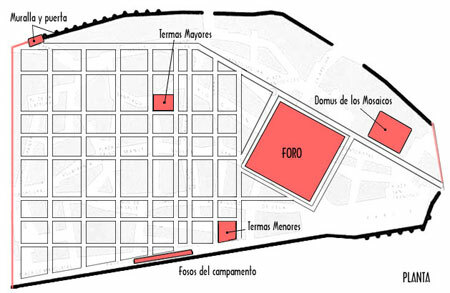 Its plan is composed by several patios with rooms around them. Its decoration is made with vegetable subjects. 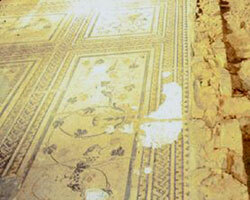 It has outstanding mosaics at the guestroom -oecus-, that gave name to the whole house. There are represented many scenes of Orpheus and the autumn. The other rooms are pavimented with signinum or spicatum. The walls. A part of the city was walled at the end of 3rd century, though it has suffered a great number of restores after partial spoils by Goths and Arabs. There are parts of a trapezoidal section wall with circular supportings or towers each 15 ms. Besides, one of the doors do survive. It seems to have belonged to a Roman craft, since it was modified by Count Gaton at 9th century. Gutter. Romans constructed a great number because of the city evolution. Residual water was taken to the close rivers -Jerga and Tuerto-. First gutter had a dintel; posterior a dome. These were 1,60 m. high and 0,90 m. wide. A very good net was composed just by four little nets that gave service the whole city.